Published: Dec. 26, 2016 at 03:02 p.m. Updated: Dec. 26, 2016 at 05:06 p.m.
Bowl season gives us a couple of quarterbacks that are worth watching on Tuesday because of their potential NFL futures. Scouts will also find some intriguing defensive prospects on the field throughout the day. Here's my look at the top 10 prospects playing on Tuesday. All times listed are Eastern. 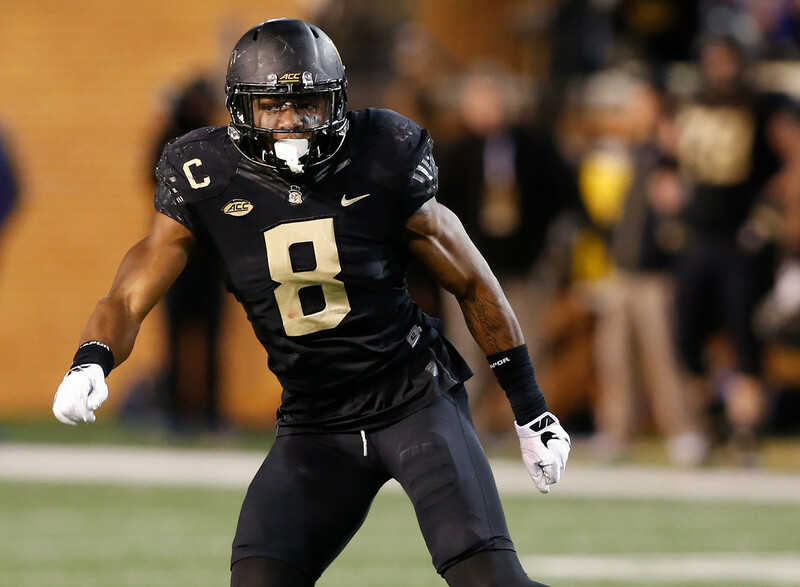 The three-year starter for the Demon Deacons seems to be in on nearly every play, leading the Demon Deacons with 19 tackles for loss (including 15.5 in the past seven games). It's not hard to find jersey No. 8 on the field, as his 6-foot-3, 240-pound body sticks out at the second level. His explosive tackling between the tackles and habit of attacking ball carriers before they get started should be on display yet again in the Military Bowl. NFL teams looking for a linebacker with the potential to play inside or outside in a 3-4 system will take a long, hard look at his performance in this game. In a conference with Clemson, Florida State, and Louisville, good players on teams like Wake are often lost in the shuffle. Ejiofor's combination of power and agility helped him record 10 sacks in 2016, as well as third-team All-ACC notice from conference coaches and media. Ejiofor (pronounced EDGE-eh-for) has the athleticism to play on either side of the line of scrimmage, and his tenacious nature makes him a good fit to move inside in passing situations to disrupt the pocket. I'm guessing Marks will be marginalized by some scouts because of his average size and speed. But I'm not sure there's a tougher receiver in the country than Marks. The 6-0, 190-pound receiver from Venice, California, was his conference's defensive player of the year in high school, showing his ability to bring the physicality when needed. He's been a reliable target since arriving on campus, becoming the Pac-12's all-time leader in receptions. When Marks faces another intriguing NFL prospect in Minnesota CB Jalen Myrick, go get your popcorn because it's going to be a show. A big-bodied left tackle (6-5, 320), Dawkins has been a fixture on the line since his freshman year. It's fun to watch him come off the ball in the run game, as he can start low to get leverage, pushing his man back. Dawkins has fairly light feet for his size, which prevents a lot of pass rushers from beating him around the edge. His best position might be right tackle in the pros, but with a bit of coaching on keeping his head up and resetting his hands to stay engaged in pass pro, he'll be worthy of a mid-round pick. McNichols, who intends to enter the 2017 draft, is the engine of the Broncos' offense. The junior has 27 touchdowns -- 23 on the ground and four in the air. Not unlike former Boise State back Doug Martin, McNichols' compact build (5-9, 212) makes him difficult to tackle. He gets big gains because of his willingness to follow blockers and cut to daylight. Add in 84 receptions over the past two seasons, and NFL teams will understand that he's a three-down player worthy of carries on Sundays. Based on what Reddick has done on the field the past couple of seasons, it's likely he will put up great agility numbers at the NFL Scouting Combine. The senior plays with his hand down and standing up for the Owls, though it seems his best NFL fit would be as a 3-4 linebacker. Sure, his 9.5 sacks this season garnered him first-team All-American Athletic Conference accolades, but scouts are also impressed by his willingness to get off blocks and chase ball carriers from behind. Athleticism and hustle are a great combination. In a down year for the Baylor program, Cannon's play has been a shining light. The team's leading receiver with 73 catches for 989 yards and 11 scores puts him on the radar of scouts looking for a playmaker. He'll challenge Boise State cornerbacks with quickness off the line of scrimmage and an ability to stop on a dime. Cannon's also not afraid of contact. He's willing to hold off tacklers to get the extra yards, as well as block downfield. Luani's been overshadowed by the defensive talent on the roster of rival Washington, but he takes a backseat to no one in terms of competitiveness and football IQ. The former junior college All-American from Samoa is as adept as any safety in the country in filling gaps in the run game, as well as ensuring receivers know of his presence over the middle. Athletic and tough, Luani's a future starting NFL strong safety. Falk's play in the Cougars' last two games, both losses, was not exemplary (four interceptions, completed 57.3 percent of his passes). His skill set is still intriguing, though. He can find receivers at every level of the field, and is given a lot of responsibility at the line of scrimmage by head coach Mike Leach. Falk, who intends to return to WSU for his senior season, typically uses his accurate arm and soft touch over the top to rack up yardage. A strong game against the Gophers defense will be a sign to scouts that his potential can become reality. Boise State has been known for efficient quarterback play for some time, though the passers running the scheme haven't been ideal in terms of NFL-caliber size and arm strength. It's a different story with the 2013 Washington State Player of the Year, who is the nephew of Super Bowl-winning quarterback Mark Rypien. At 6-2, 200, he's not huge by scouting standards, but his arm strength allows him to throw into tight windows over the middle and get the ball deep. The sophomore will be one of the top players to watch in college football in 2017, and could get some Heisman talk started with a win over Big 12 foe Baylor in this contest.